On June 10th, two official installations were unveiled that will provide permanent recognition to Joni Mitchell's legacy and recognize Saskatoon as her hometown during her formative years. 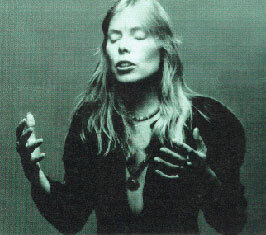 As part of this dual ceremony taking place that day, the public gathered in front of the Broadway Theatre at 1:30pm to witness the unveiling of a plaque, then walked along the Broadway Bridge to River Landing to officially designate the promenade located between 2nd and 3rd Avenue at 2:30 pm as the Joni Mitchell Promenade. As a twist on "Random Acts of Kindness" Tourism Saskatoon invited all people to create and express themselves in "Random Acts of Culture" to recognize, celebrate, and animate the afternoon and pay homage to Ms. Mitchell as a creative force. The intention was to create a free space for all people to share the strength and breadth of the Saskatoon arts community and express themselves through art. Anyone was invited from the community with a passion for the arts to entertain the procession of people as they travel between the two points in any way they saw fit - from singing songs, playing music, reading poetry, painting, dancing, and in general making the city come alive with everything short of "moons and Junes and Ferris wheels." Thank you sharing the inauguration of Joni's commemorative day. Joni has a lot of people who call themselves her friends although she has never personally met them. It was satisfying to see the people come together and remember Joni in her hometown.